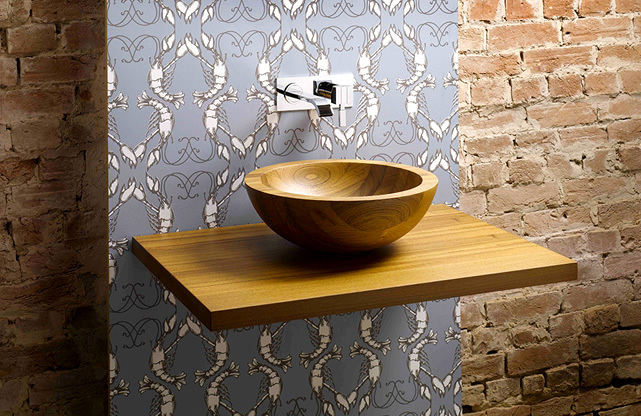 Wood basins are often chosen when redecorating, for both aesthetic and sustainability reasons. They have a wonderful natural look, which adds a certain warmth to a room and if sourced from sustainable forestry, wood basins are a great way to create an eco friendly room. Using wood in a room can create many different types of looks. If you love rich, deep colouring which will make a bathroom or kitchen look more luxurious, then a wood basin made from dark teak or oak can make all the difference. Combined with tiles or a wall painted a deep red colour, you can easily construct your dream room. Perhaps you prefer clean, simple and elegant designs, in which case a lighter coloured basin in pine, beech or birch will create a light and spacious look in a modestly sized room. All of these types of wood basins can be stained in order to make a personalised design to fit in perfectly with the rest of the room. Wood in a bathroom, kitchen or en suite is fast becoming a popular choice, because you can create so many different styles with the same material. However, in a room such as a kitchen or bathroom, where moisture, dramatic temperature changes and mould can cause problems, many people have concerns regarding the durability of wood over, say, ceramic or porcelain basins. However, this needn’t be a problem. Gone are the days when wood was a poor choice for bathrooms. Before the introduction of wood treatments, wood was indeed more susceptible to mould, surface scratches and general wear and tear, but with today’s wood surface treatments which protect from damage, you can choose a wooden material for your basin without worrying about how long it will retain its stylish appearance for. When a wood basin is properly treated with the correct chemicals, everyday wear and tear will not show up for many years. Spillages such as toothpaste, cosmetics and other products will not damage the appearance. Almost everybody wants not only for their rooms to look great, but also to feel that they can relax and not worry about every little scratch or spillage. In a bathroom, where furniture is sparse, if present at all, the basin, bathtub and toilet are the focal points of the room. Therefore, these pieces and the materials they are made out of must be chosen with great care. A wood basin can make a room look as classic, or contemporary as you want, provided it is the right design, colour and appropriate size. In smaller rooms, having a large mirror, perhaps with a light fixture and a light coloured wooden basin can create the illusion of space. In larger rooms, you can afford to use darker wood which draws the eye inwards and creates a cosier appearance. You can choose to match all of the pieces in the room to the wood basin, or for a more modern look you could use contrasting materials.